d-aspartate is transiently present in the mammalian brain since it substantially occurs in embryonic phases and strongly decreases after birth, due to the postnatal activity of the catabolizing enzyme d-aspartate oxidase (DDO). Pharmacological evidence indicates that d-aspartate binds to and activates NMDA receptors (NMDARs). 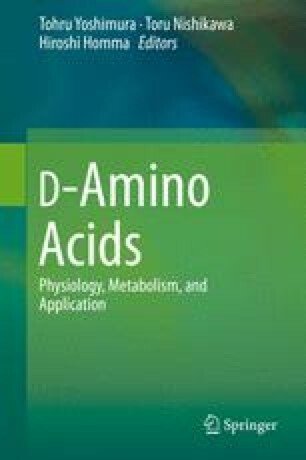 To decipher the function of d-aspartate in mammals, genetic and pharmacological mouse models with nonphysiological high levels of this d-amino acid have been generated. Their characterization has evidenced that increased d-aspartate enhances hippocampal NMDAR-dependent synaptic plasticity, dendritic morphology, and spatial memory. In line with the hypothesis of a NMDAR hypofunction in the pathogenesis of schizophrenia, it has been also shown that increased d-aspartate produces corticostriatal adaptations resembling those observed after chronic haloperidol treatment, and protects against prepulse inhibition deficits induced by psychotomimetic drugs. Moreover, a study in healthy humans has demonstrated that genetic variation in DDO gene, predicting potential increase in d-aspartate levels in postmortem prefrontal cortex, is associated with greater prefrontal gray matter and activity during working memory. Interestingly, a significant reduction of d-aspartate content has been detected in the postmortem brain of patients with schizophrenia. In line with a dichotomous effect of NMDAR stimulation on brain physiology, constitutive elevation of d-aspartate levels is also associated with detrimental effects, including precocious hippocampal age-related deterioration. Based on the agonistic role of d-aspartate on NMDARs and on its abundance during prenatal life, future studies will be crucial to address the effect of this molecule on developmental processes controlled by NMDARs.